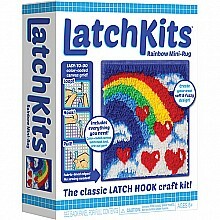 Loop, hook and pull to make this soft and beautiful rainbow mini rug! From Kahootz, for ages 6-10 yrs. Loop, hook and pull to make this unicorn mini rug! It's so easy to learn! From Kahootz, for ages 6-10 yrs.